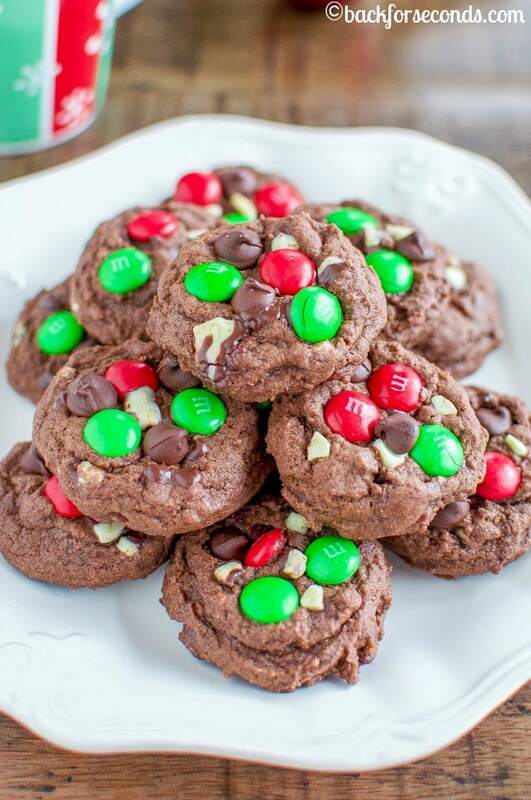 These soft, thick, and chewy Chocolate Peppermint M and M Cookies are the perfect easy Christmas cookie recipe! The green and red make them extra festive! I am in full on Christmas cookie making mode! And I have way more ideas than I have time. Lucky for all of us, I made the time to bake these cookies. Holy moly, you guys, these are quite possibly the Best. Cookies. Ever. The cookie itself is thick, soft, chewy – almost like a brownie, but not as dense. There is a double dose of mint here – peppermint extract and Andes mints. Annnnnnd this is me so there’s also a triple dose of chocolate! Cocoa powder, chocolate chips, and m&m’s! When you bite into one of these Chocolate Peppermint M and M Cookies, you get the crunch from the m&m’s, soft, chewiness from the cookie, melty, smooth chocolate chips and Andes mints, and you will her the angels sing! Maybe that was just me, but seriously. These are SPECTACULAR! Enjoy! 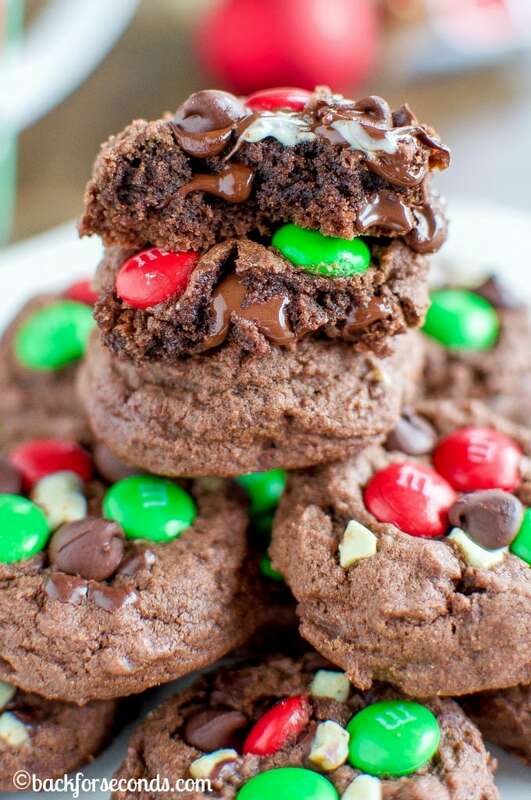 You can’t go wrong adding m&m’s to cookies ; ) ever. GIRL! 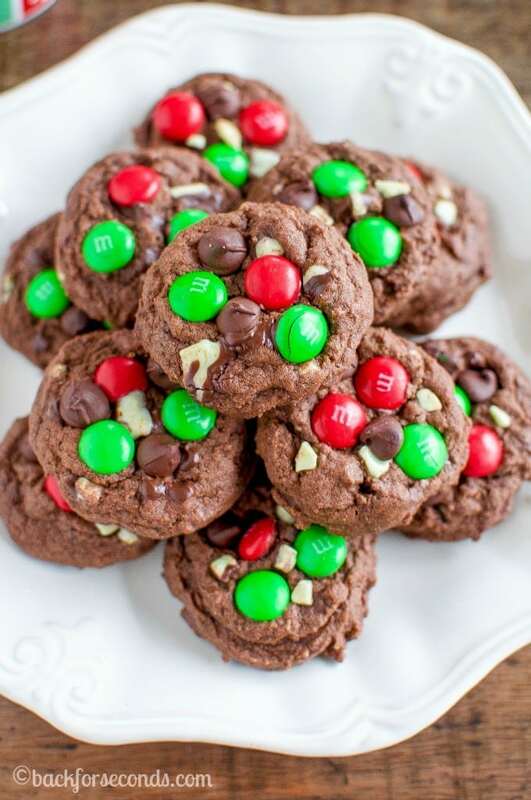 These cookies are utter Christmas perfection! Oh my gosh – these do look amazing – so mouthwatering! Love the festive M & M’s, too. You are the queen of all things sweet and delicious, Stephanie! Great looking cookies! I have to agree with you, these ARE spectacular!! I need to ad these to my cookie rotation this week! 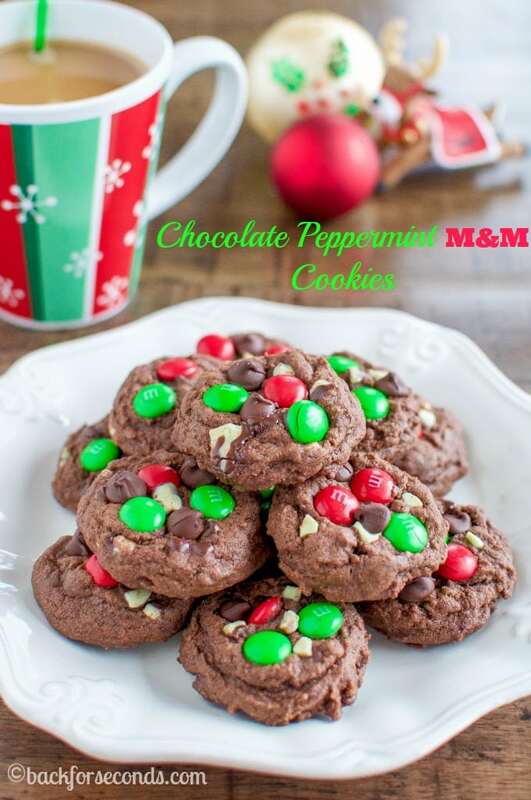 These are so festive – perfect for the holidays and the flavor combos – love it! Stephanie – you always have the best sweet treats! These cookies are the type that everyone goes crazy for at Christmas. I need one (or two) in my life! Chocolate + all the mix-ins = cookie success in my book! Oh what a shame! Andes are small chocolate bars with layers dark chocolate and mint. You could just use chocolate chips and add a touch more mint extract. They will still be delicious!